The winds blew strong and cold across our small base camp of three sleeping tents and one large kitchen tent. The rope fixing progressed well, but, still acclimatizing at 5300 meters, I was worried every time the climbing Sherpas would leave for the Southwest Ridge, steep and exposed to the winds. Hopeful, I monitored the weather forecast texted to me every day: all it would say would be that the wind speeds would keep increasing. After three freezing-cold days and nights at base camp, I could no longer wait for good news, and decided to climb up to Camp 1 at 5900 meters to take a closer look at the route and spend one night at that elevation to acclimatize. 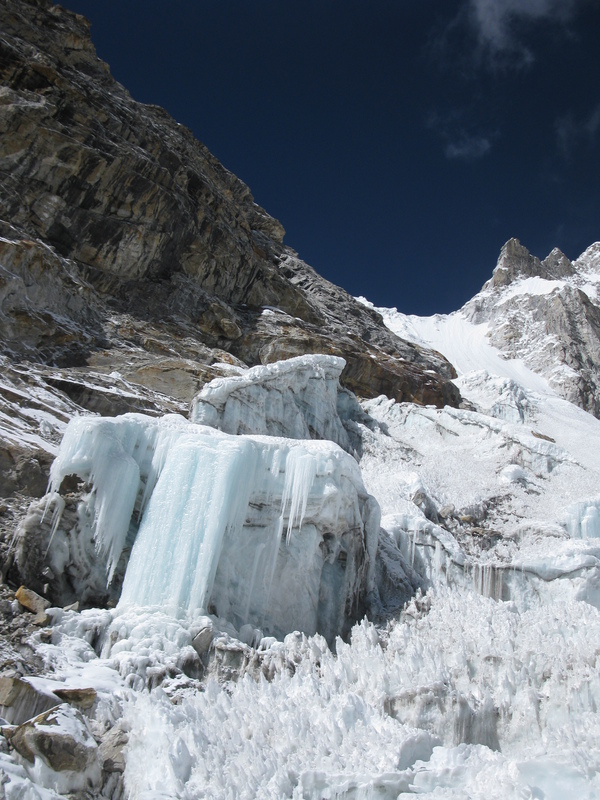 As I slowly climbed higher on wobbly rocks and past the white teeth of the icefall’s seracs, I felt the fatigue of the three nights I’d spent without sleep. My -40C sleeping bag is wonderfully comfortable, but my metabolism is too slow to warm it up when the levels of oxygen in my blood drop – as they inevitably do in thin air – so the down always remains cold, as do all the layers of clothes I wear ‘to bed’. What I usually do, then, on those cold nights in the mountains is curl into a ball and focus on the warmth in my feet – the chemical warmers stuffed between two pairs of thick socks – until morning. The problem with winter mountaineering is that even when the sun does rise and touch the icy tent with its rays, most of their warmth, filtered through the cold air, is stolen by the wind, and the little that’s left must suffice to help one get out of the sleeping bag and get to work. Another frustration is that everything is frozen in the morning: sunscreen, face wipes, water in the water bottle from the night before – and it takes forever to warm things up. 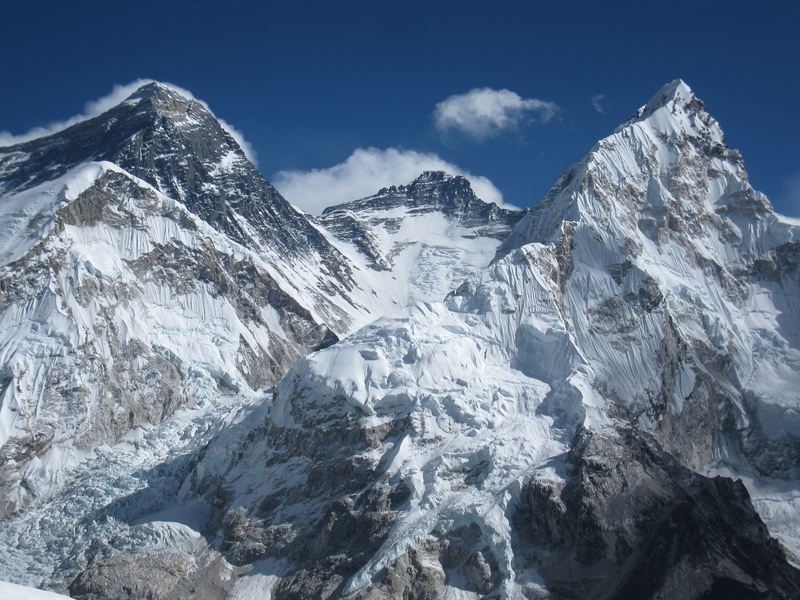 I found Camp 1 suspended over the most stunning Himalayan scenery on a serac that creaked unpleasantly as it greeted Dorje and I for the night on the ‘mattress’ of winter ice. 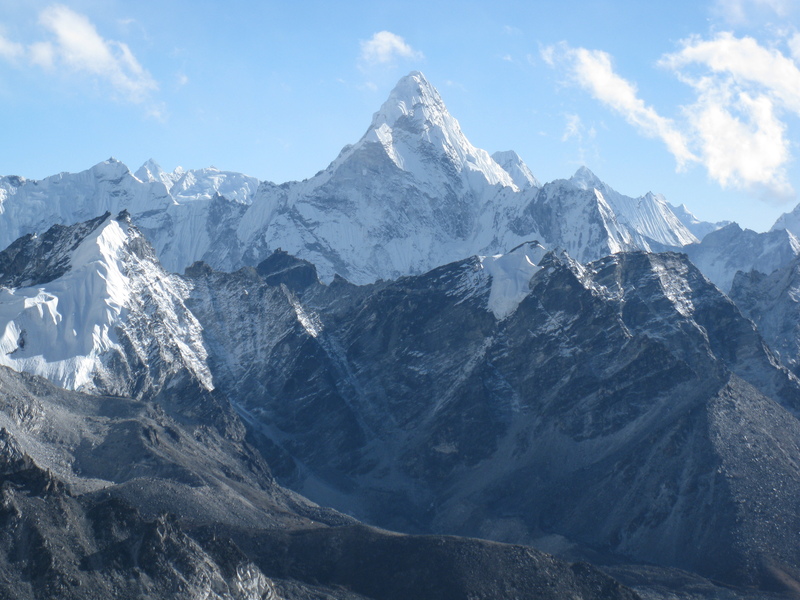 We pitched our tent in a safe and sheltered spot, and from there I could see the route to the summit of Pumori; I couldn’t help grinning in anticipation of the hard mixed climbing the Southwest Ridge promised. 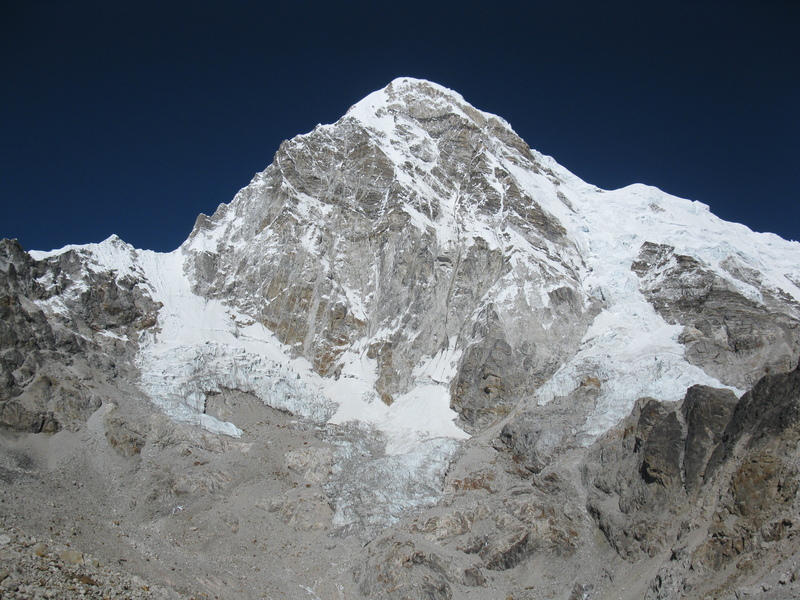 The three climbing Sherpas would try to fix rope up to Camp 2 at 6500 meters that day, but I was not sure it would be possible for them to accomplish the task, given the wind speeds and the low air temperatures. I warned them to be careful, and stayed behind only to see them come down in a few hours, almost literally blown off the ridge. It would be a bad, bad night at Camp 1. Late in the evening I received a new weather forecast, which suggested that the wind speeds would continue to increase, with hurricane-force winds settling down for the winter above 6500 meters. ‘We can’t climb in the jet stream, Dorje,’ I told my tent mate and sirdar of 8 expeditions, ‘and we can’t wait for the jet stream to lift off in this cold for weeks, either.’ As I looked at the wind speeds on the screen of my phone – 70, 85, 100 mph on the summit of Pumori – the thought first entered my mind, clear as the night, that we would not reach that summit, that I would not get what I want – again – and that once more I would have to swallow the bitter, humbling pill of defeat. Everyone who’d ever doubted me would be right, and would be justified in saying: ‘oh, but of course you couldn’t do it, not even with the strongest team in the Himalaya. You’re just not a climber, Princess, and certainly no expedition leader.’ As the night in the tent turned from dark blue to black and the creaking of the ice underneath our tent grew more frequent, I just kept sitting there, in my down suit and sleeping bag, staring at the numbers which translated into one word – ‘impossible’ – and listening to the sounds, which reminded me of the Manaslu avalanche. I was scared to stay and scared to leave, as if again suspend over my fears like I was on the way to Camp 1 on Ganesh, paralyzed, helpless. After what felt like an endless succession of hours, the light in the tent began slowly to brighten, and at 6 am Dorje was up and the water was boiling, announcing the start of a new day on the hill. 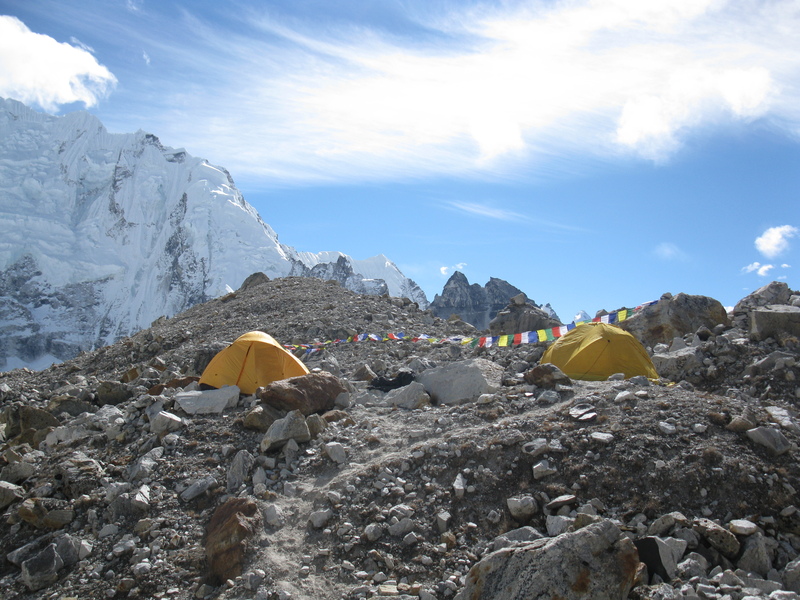 We considered climbing towards Camp 2 but eventually descended to base camp. I truly cannot imagine being that cold and still functioning….wonderful write and images. Thank you, as always, for reading! The cold in itself is, in fact, less of a problem than the inability to warm up – there’s just no warmth in winter up in the mountains. This complete absence of warmth makes one feel depressed, which in turn makes even the smallest problems much harder to deal with than usual.